Wondering how best to organize your campaigns, funds, events, and appeals? 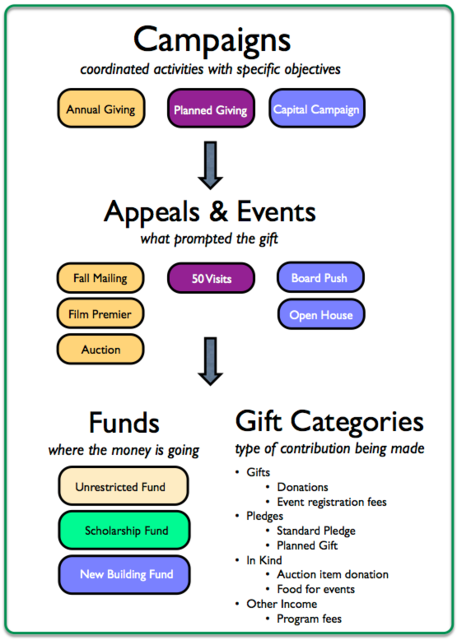 Please look at the handy graphic below, which illustrates how to organize campaigns, appeals and events, funds, and gift categories. Read further for details about each item contained in the graphic. Campaigns should be broad, overarching fundraising efforts. If you have, or even if you just imagine having, a large fundraising team with several Directors, how would you organize the staff? This is a good way to think about campaigns as well: Each campaign represents a coordinated set of activities with a specific objective. As you name your campaigns, you should also consider separating activities related to a single operating year from those that are about longer term fundraising. That way you can quickly see how much money you've raised for your immediate needs (a very useful data point!). Appeals and events both answer the question, "How did we raise this money?" Surely, you did something specific to raise the gift (or, if not, you could assign it to an appeal called "Unsolicited"). Each gift should be assigned to either an appeal or an event, but not both. Funds answer the question, "Where is this money headed?" Your funds should map to your Classes in your accounting software. Gift categories are a good way to classify the type of contribution you're receiving, such as a donation versus an event fee. Your gift categories should map to your Chart of Accounts in your accounting software. Together, these fundraising attributes will give you a greater ability to measure your progress against your goals and to measure your year-over-year improvements. NOTE: You do not need to create a new campaign for every fiscal year. Each gift you receive will already be tied to a specific gift date and deposit date, so whenever you want to run date-specific queries, use those date fields. That way you won't end up with dozens of campaigns in your Little Green Light account. On the other hand, you will likely create new appeals each year, because you'll have a new solicitation list each time. If you would like to learn more about how to implement these practices in LGL, please review our help documentation on Campaigns and Funds and Appeals and events. You can download a PDF version of this article as well.